Captain Fun Pants and his best mate Pirate No Beard are back for the school holidays by FARTULAR DEMAND! As part of this year's stellar Melbourne International Comedy Festival line-up, Captain Funpants returns with the Mystery of the FunOmatic Fun Wand! This critically acclaimed production sees two of Australia's funniest comedians, Harley Breen (ABC's Comedy Up Late, The Project) and Heath Franklin (Ronnie Johns Half Hour, Wednesday Night Fever) play to an audience their own mental age: children. 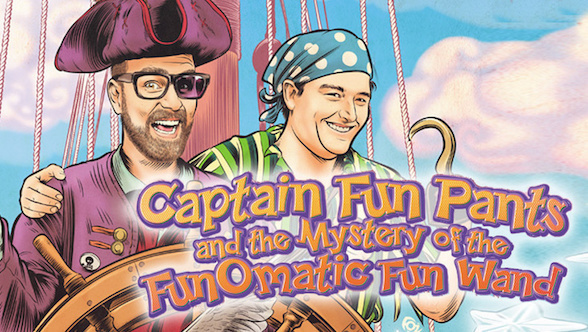 Come aboard the Good Ship Crazy these school holidays and head back to fuNtOwn with Captain Funpants and Pirate NoBeard! They are on a quest to retrieve the FunOmatic Fun Wand, but along the way they'll have to survive the Forest of Farts (pee-yew! ), wrestle Princess Poppy-Puke and out dance Party man to escape Bed Time Island! It's sure to be a FunOrriFic adventure for little pirates of all ages! Captain Funpants and the Mystery of the FunOmatic Fun Wand will play for a strictly limited season: 5 shows only - March 26th & 27th, April 1st, 2nd & 3rd at 4pm. Tickets are now on sale through Ticketmaster online and Ticketmaster outlets. Prices range from $12 to $16 (additional booking fees may apply). For more information on this upcoming season of Captain Funpants and the Mystery of the FunOmatic Fun Wand, please visit the Melbourne International Comedy Festival website.